olism. In the liver, stepwise deiodination is the prime pathway for inactivation (Figure 6-13A). Other transformations that have been detected include /3-glucuronide and sulfate conjugation with the phenol functionality and transamination or deamination of the alanine side chain (Figure 6-13B). Specific compounds that interfere with the thyroid follicular peroxidase are used both in research and in certain clinical circumstances. In general, small doses of goitrogens preferentially block the coupling reactions in the thyroid, while large doses block the iodin-ation of the tyrosyl residues in thyroglobulin. The most potent antithyroid compounds contain the thionamide group (see Figure 6-14). The simplest member of the group is thiourea; the compounds thiouracil and 6-n-propylthiouracil are significantly more potent. 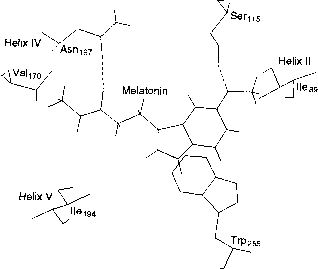 The structures of several antithyroid drugs are given in Figure 6-15.